The Fiano grape variety dates back more than 2000 years. Its name comes from the roman ‘vitis apiana’, meaning vine beloved of bees. Although Fiano is grown in other parts of Campania, Fiano flourishes in the area around Avellino, with its mild microclimate, diurnal tempretaure variations and mineral-rich soils of volcanic origin. 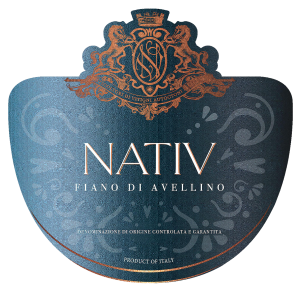 The Nativ Fiano di Avellino is medium gold in color, with complex aromas of fruit, such as pear and apricot and notes of toasted hazelnuts. Dry on the palate with rich aromas and a marked tanginess. Fiano is perfect as an aperitif but it will offer great enjoyment when paired with all sorts of seafood dishes and shellfish, oysters, octopus salad and fresh herbed cheeses. - Please note there is a label change with the 2017 vintage . Harvest is done by hand in mid-October. Soft pressing of the whole bunch, cold static decanting and fermentation through selected yeasts at controlled temperature. In stainless steel for 4 months.